Since he became Pope, the press has been trying very hard to paint Pope Francis as a liberal who will change Church teachings. Numerous false stories have arisen about what the Pope is alleged to have said. The following article from December 2014 is an eye-opening example of how the press create stories and run with them often without checking their facts. Please be very suspicious of anything Pope Francis is alleged to have said, and always check official sources before you accept a news story as truth. Stories swirled this week that Pope Francis said animals can go to heaven, warming the hearts of pet lovers the world over. Unfortunately, none of that appears to be true. “Paradise is open to all of God’s creatures,” Francis was reported to have said to comfort a distraught boy whose dog had died. If true, the story would have been a sparkling moment on a rainy November day, and the setting in St. Peter’s Square would only have burnished Francis’ reputation as a kindly “people’s pope.” The story naturally lit up social media, became instant promotional material for vegetarians and animal rights groups, and on Friday even made it to the front page of The New York Times. Yes, a version of that quotation was uttered by a pope, but it was said decades ago by Paul VI, who died in 1978. There is no evidence that Francis repeated the words during his public audience on Nov. 26, as has been widely reported, nor was there was a boy mourning his dead dog. So how could such a fable so quickly become taken as fact? The trail of digital bread crumbs then appears to lead to an Italian news report that extended Francis’ discussion of a renewed creation to the question of whether animals too will go to heaven. “One day we will see our pets in the eternity of Christ,” the report quoted Paul VI as telling a disconsolate boy years ago. The story was titled, somewhat misleadingly: “Paradise for animals? The Pope doesn’t rule it out.” It wasn’t clear which pope the writer meant, however. Vecchi faithfully recounted the pope’s talk about a new creation, and also cited Paul VI’s remark. According to The New York Times, which issued a massive correction to its story Friday, Pope Francis actually said: “Holy Scripture teaches us that the fulfillment of this wonderful design also affects everything around us.” The writer of the article concluded those remarks meant Francis believed animals have a place in the afterlife. But the headline put Paul VI’s words in Francis’ mouth, and that became the story. When The New York Times went with the story, along with input from ethicists and theologians, it became gospel truth. 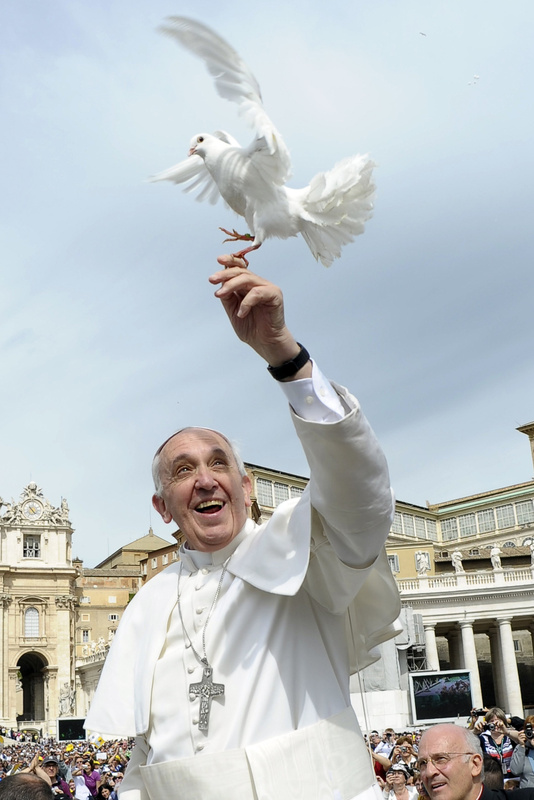 Television programs discussed the pope’s theological breakthrough, news outlets created photo galleries of popes with cute animals, and others used it as a jumping off point to discuss what other religions think about animals and the afterlife. At America magazine, the Rev. James Martin wrote an essay discussing the theological implications of Francis’ statements and what level of authority they may have. It was all very interesting and illuminating, but based on a misunderstanding. The story had so much going for it: Francis took his papal name from St. Francis of Assisi, the patron saint of environmentalism who famously greeted animals as brothers and sisters. Pope Francis is also preparing a major teaching document on the environment, and almost since the day he was elected in 2013 he has stressed the Christian duty to care for creation. Francis also blessed a blind man’s guide dog shortly after he was elected, an affecting image that was often used in connection with these latest reports of his concern for animals. Moreover, the media and the public are so primed for Francis to say novel things and disregard staid customs that the story was too good to check out; it fit with the pattern. In most accounts, Francis’ comments were also set against statements by his predecessor, Benedict XVI, who insisted that animals did not have souls. That apparent contrast fit a common narrative pitting the more conservative Benedict against the ostensibly liberal Francis. That may be true in some areas, but probably not when it comes to animals. Adding insult to injury, the Times article cited St. John Paul II as saying in 1990 that animals have souls and are “as near to God as men are.” But that, too, was a misquote, as media critic Dawn Eden explained at the website GetReligion. There should have been warnings signs: Francis has frowned at the modern tendency to favor pets over people, and he has criticized the vast amounts of money spent by wealthy societies on animals even as children go hungry. One of the dangers I have always seen in current American society is that we have reversed the intentions of our founding fathers. They imagined a country where religion was freely respected and openly tolerated (cf the First Amendment) but where no one would be compelled to follow any particular religion. We today are more and more creating a society that is inimical to religion, that wants to remove any public mention of God altogether, and more and more people are buying into the idea, even though they personally believe in God and consider themselves spiritual. The following video by a Harvard professor is an excellent statement on what I consider a very crucial error in modern society. Please take a moment to view it. It is only 1 1/2 minutes long.